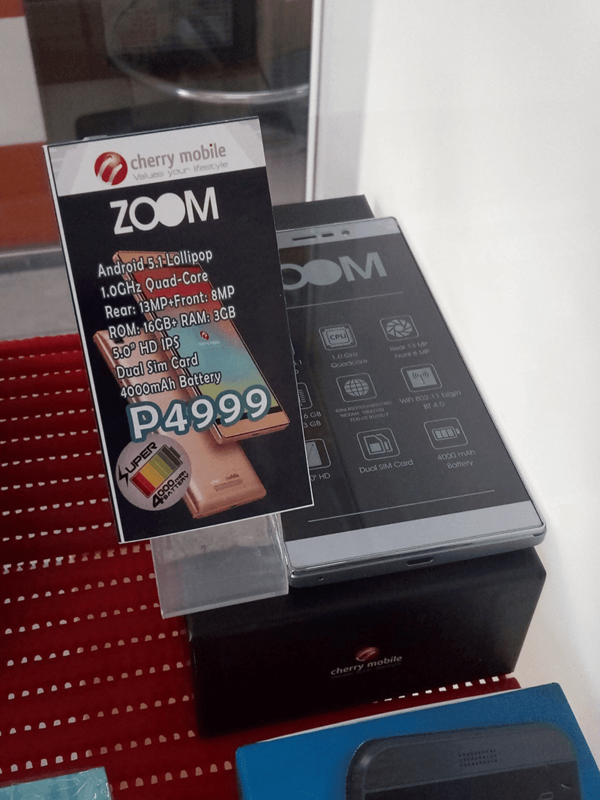 Cherry Mobile Zoom Priced, Goes With 3 GB RAM And 4000 mAh Battery For 4999 Pesos Only! Home / cherry mobile / mobile / news / Cherry Mobile Zoom Priced, Goes With 3 GB RAM And 4000 mAh Battery For 4999 Pesos Only! In a great follow-up report by Pinoyscreencast, just gathered more info about the Cherry Mobile Zoom that leaked earlier this week. What he found out about this handset is highly exciting and surprising. Related: Cherry Mobile Zoom Review - A Sub 5K Smartphone With 3 GB RAM And Long Battery Life! As a refresher, the Cherry Mobile Zoom boast a metallic looking body and a 5 inch HD IPS screen with a resolution of 1280 x 720 at 294 ppi. It goes with an unspecified quad core processor that should be the 64 Bit MT6735 SoC paired with Mali T720 GPU. We said that, because this handset has LTE connectivity and the only SoC we know that has 1.0 GHz and LTE is that chip. The phone also goes with large 3 GB of RAM, 16 GB of expandable internal storage, huge 4,000 mAh non removable battery, 13 MP main cam w/ AF and single LED flash, 8 MP selfie cam and runs on Android 5.1 Lollipop OS. The best part of the said report is the pricing of the phone, it retails at just 4,999 Pesos that can be purchased now in some Cherry stores in the country.